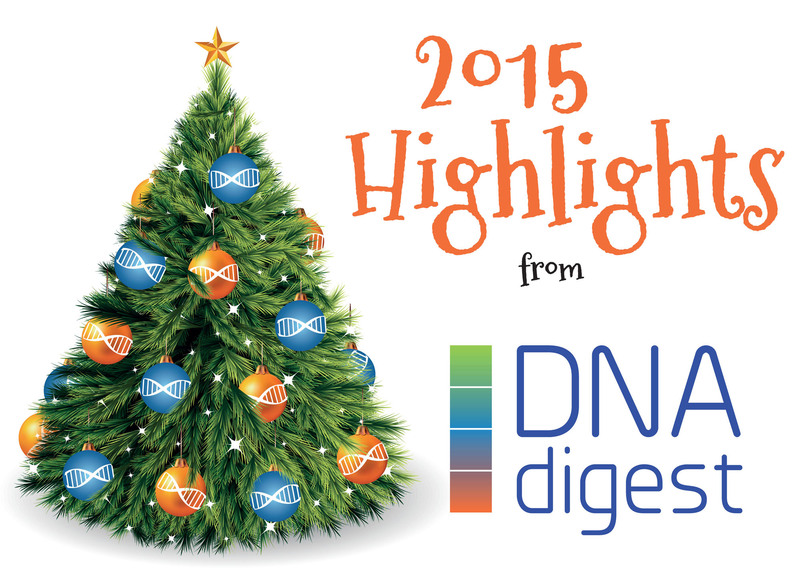 2015 was a great year for DNAdigest! We organised more events, welcomed more volunteers to the team and increased our output of online communications and blog generation! It has been a joy to watch our followers and online community grow with us and as we approach Christmas and the end of the year, we want to dedicate this blog post to looking back over 2015 and celebrate the achievements we made together! We included this in our 2015 overview because our Genomic Medicine Alliance (GMA) interview was the only one that spread over 2 parts and formed the most in-depth interview of the year. In part 1, we caught up with Professor George P. Patrinos, a member of the Scientific Advisory Committee for the GMA and he explains what GMA is, how to join and the benefits of doing so. In part 2, George discusses his role and explains the 7 different working groups within the GMA; Genomic Informatics, Pharmacogenomics, Cancer Genomics, Rare Diseases and Drug Outcomes, Public Health Genomics, Genethics and Economic Evaluation in Genomic Medicine. We included this interview into the 2015 overview because Global Alliance for Genomics and Health organised some of the best events in 2015 and also published it’s first Road Map. In this interview we caught up with Julia Wilson, Associate Director at the Wellcome Trust Sanger Institute and as well as explaining GA4GH and her role, Julia also tells us about the four working groups tasked to catalyse the sharing of genomic data; Data, Security, Clinical and Regulatory and Ethics. We included this interview into the 2015 overview because Intel is one of the largest organisations DNAdigest has had the pleasure of interviewing. Bob Rogers, Chief Data Scientist for Big Data Solutions talks about his role, the Big Data Solutions initiative, explaining BIG DATA to lay people and what he will bring to the BioData World Congress as a key speaker. We managed to catch up with Bob at the BioData World Congress and he won a DNAdigest T-shirts for taking part in our survey. We included this interview into the 2015 overview because OpenSNP is a new (and growing) initiative that gives people a chance to donate their personal genetic data into the public domain and is very worthy of extra attention. Bastian Greshake from OpenSNP is also a key contributor and advocate to open science and is changing perceptions within the scientific community by working with the Winnower Writing Competition by showcasing how ‘data sharing’ can help researchers advance in their careers. We included this interview into the 2015 overview because what we really found interesting was how User Experience and User Interface effects the developments of platforms tasked at making data sharing and searching easier. Jana Grajciarova from Repositive spills the beans on what influences the development of repositive.io platform, why UX (User Experience) is so important and what lead her from studying wooden products and structures to becoming a web developer. The DNAdigest team would like to take this moment to say thank you, to all of our followers and readers for your support. May your Holiday season and New Year be filled with much joy, happiness and success.